Do you know how much your organization spends on print? Do you have access to the data you need to calculate the total cost of ownership of your print fleet, consumables, and IT man-hours spent repairing and maintaining print assets? For most organizations, the answer is no. This is one of the main ways businesses and enterprises let money seep out of company accounts unnoticed. Not only does print procurement come with significant costs, but so do print consumables and print-related IT service calls. These organizations don’t have the time or resources to reconfigure their print infrastructure from the bottom up. As a result, they are likely to leave things as-is, ignoring the potential benefits a highly efficient managed service workflow could provide. In any corporate office environment, suboptimal use of office resources is almost guaranteed. Efficient processes don’t spring up out of nowhere – they need to be established through insight and effective leadership. Managed print services allow organizations to turn their print costs into print assets by outsourcing specific elements of their print-related processes. The primary goal is to outsource high-volume, low-impact work that takes up the majority of your team’s time. Managed print expertise is key to improving efficiency and reducing wasted man-hours. There are a few key areas where most organizations can leverage managed print services to great success. These are the processes that take up the most time without generating clear value for customer-oriented processes. It’s easy for IT technicians to get stuck in the break/fix cycle. At its worst, this environment can keep IT talent perpetually stuck fixing broken equipment to prevent downtime. Managed print services can allow your team to focus on more valuable strategic initiatives, while employing third-party technicians to prevent downtime with preventative maintenance. Consumable purchases don’t drag productivity down – unless they aren’t made on-time. With a managed print service agreement in place, you can outsource and automate the replenishment of consumables so that employees no longer experience interruption due to missing toner cartridges. Optimizing your print fleet means putting your most cost-effective print equipment in the service of your highest-volume workflows. Managed print service providers like Office Technologies are able to do this using advanced usage tracking to ensure every employee has access to the right hardware. You can’t manage what you can’t measure. Managed print services allow organizations to gain unprecedented visibility into print costs and track print asset usage down to the individual user. Generate reports and understand print costs like never before. 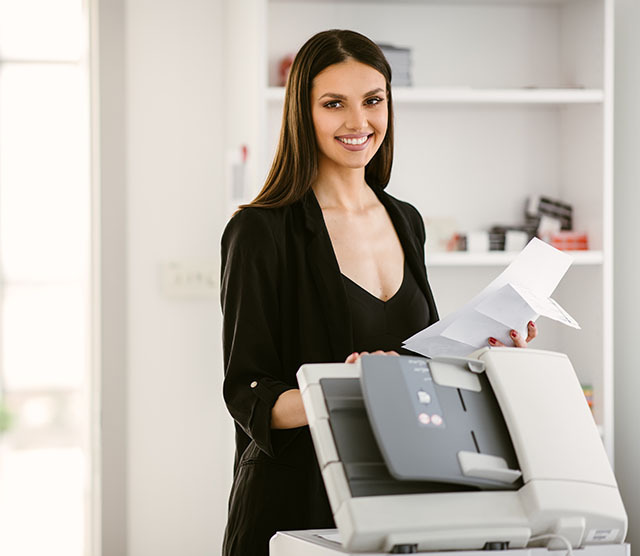 With a managed print service provider like Office Technologies handling your organization’s print-related workflows, you can streamline your company’s ability to respond to growth and peak periods with ease. Managed print services are much easier to scale than traditional in-house print infrastructure. In an in-house environment, you would have to hire new IT talent and procure new print equipment in order to compensate for growth. This requires accurately predicting your future print needs without having access to the industry’s most sophisticated print assessment technology. The likelihood of overspending is high. But with a managed service provider, all you need to do is tell your provider that you need to update the terms of your service contract. You can do this instantly, and then instantly scale your print infrastructure back to its previous size if it turns out that the growth was only temporary. It is a risk-free way to manage print needs in a dynamic business environment. It’s time to streamline your print strategy with the latest technology. Schedule a demonstration from one of our print specialists to find out how much our managed print solution can save you.